Chris Moneymaker is one of the men responsible for poker boom. It was his win at the 2003 World Series of Poker Main Event that made so many people think that they could do it too. Chris had paid $40 to get into the $10,000 buy-in event, winning a WSOP satellite entry that would prove to be his ticket to poker fame. 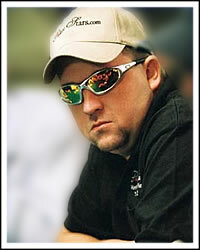 Born on November 21, 1975 in Atlanta, Georgia, Chris Moneymaker lived the normal life. He earned a Master’s Degree in accounting from the University of Tennessee, and was making $40,000 a year at his accounting job. The poker movie “Rounders” got Chris interested in Texas Holdem and he started playing with his friends. He then signed up at the online poker room PokerStars in order to take his game to the next level. He decided to throw $39 into a satellite to the WSOP Main Event just to see how he did. To his surprise, he won that satellite as well as the next satellite to earn his way into the 2003 WSOP. Still, Chris Moneymaker kept his expectations low, just wanting to make it through the first day. He did that easily, building up a respectable chip stack. His new goal was to make the money, and he did that. Finally he decided to go for the win, and he did, beating out Sam Farha in a heads-up match that is now legendary thanks to Chris Ferguson’s all-in bluff against Farha. Chris Moneymaker was the Main Event Champion and $2.5 million richer. Chris Moneymaker quit his job as an accountant to take advantage of his instant celebrity status. He now plays poker for his job and is a spokesperson for PokerStars. Chris Moneymaker’s biggest poker success since winning the WSOP Main Event was his second place finish in the World Poker Tour’s Bay 101 Shooting Starts tournament. Chris Moneymaker plays online at PokerStars under the screenname money800. You can play against Chris Moneymaker by signing up an account at PokerStars through us.